Pamela's Photo The top of the steamer for vegetables is off for this picture. 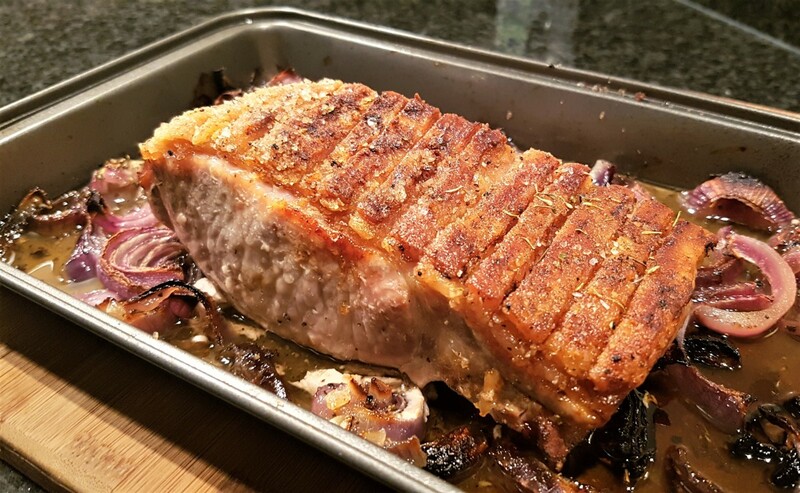 There are many good reasons to cook pork loin or any other meat on a rotisserie, whether it is on an outside grill or on an indoor rotisserie. 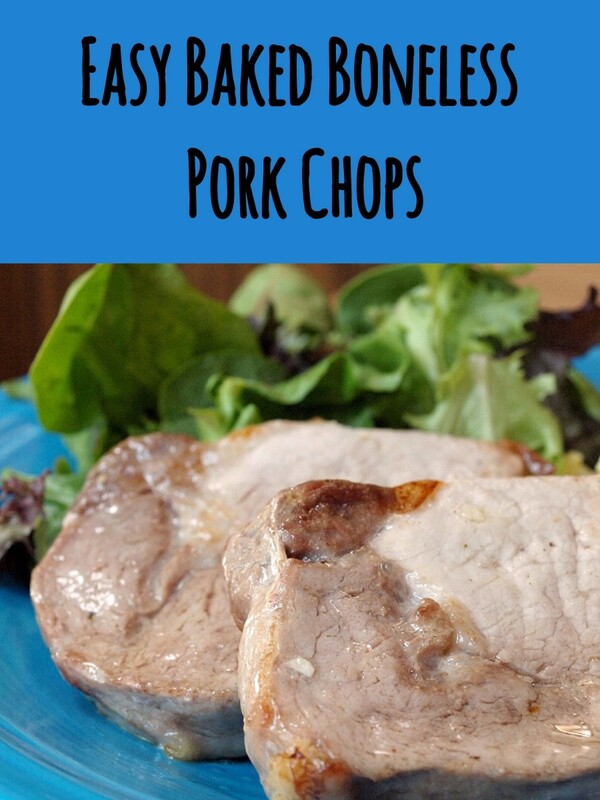 Pork loin is a favorite cut of meat for our family. The rotisserie method of cooking will seal in the juices, and it drains off all the fat. For instance, if you are cooking a chicken (another favorite), about 1/4 cup of animal fat drops off a 4 pound chicken. Using a rotisserie gives you a wide selection of meats and vegetables. We are able to cook a 15 pound turkey for 12 minutes per pound. Our rotisserie also has six metal kebob skewers, and there is a wide variety of meals possible using them. Another advantage of using a rotisserie is the meat or fish browns evenly. 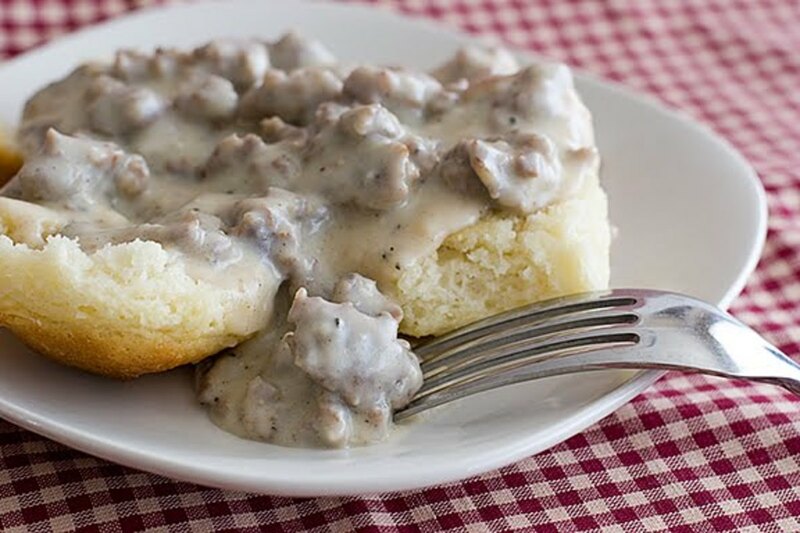 This is a great recipe for Sunday dinner or for company. You can prepare the easy recipe ahead of time and enjoy time chatting with your company, rather than standing in the kitchen. 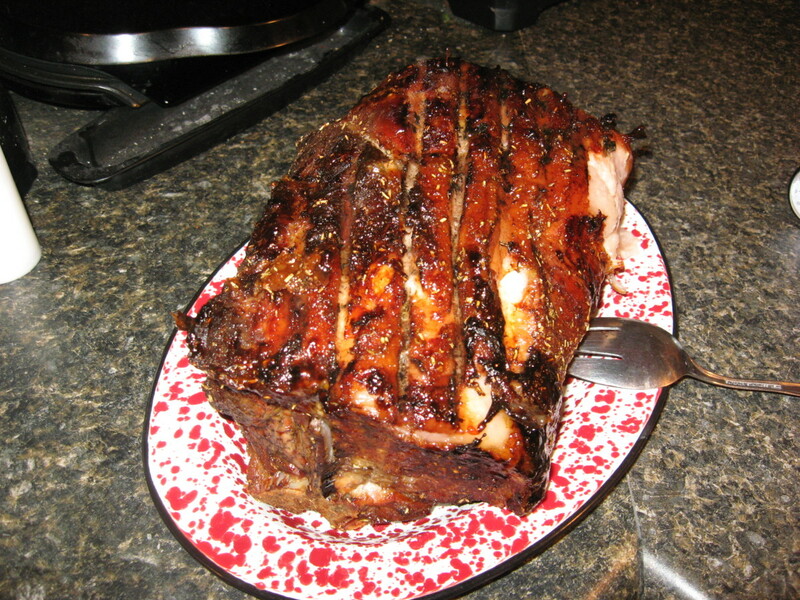 1 Boneless roast pork loin, 2-4 lbs. 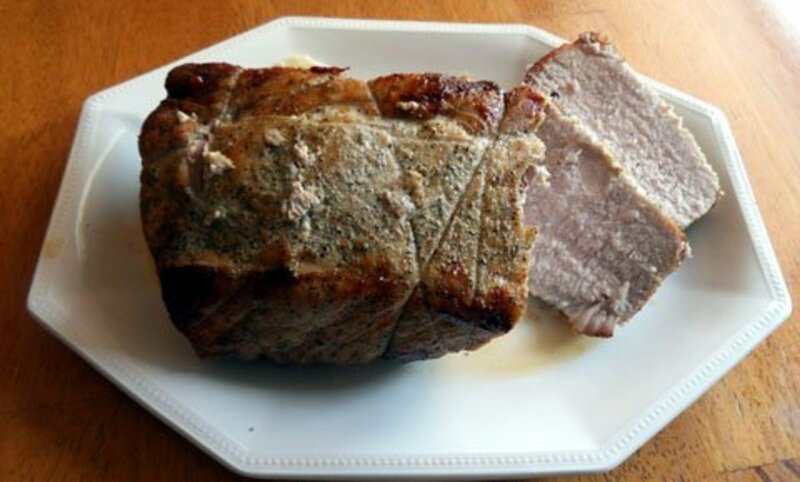 Prepare your pork roast by rinsing under cold water and pat dry with paper towels. Use a sharp knife and make 4 deep slits into the meat, 2 slits evenly on each side and push a piece of fresh garlic down deep into the meat. Tie your roast firmly together with household string if necessary to make sure that it holds together as it cooks and rotates. Move your pork roast to a working surface and season the entire roast generously with season salt, garlic powder and thyme. Use your hands and rub the seasonings deep into the roast over and over until you can no longer feel the grittiness of the seasoning and the thyme leaves appear to be evenly spread throughout the roast. Fit the pork roast snugly onto the rotisserie rod as dead center as possible. 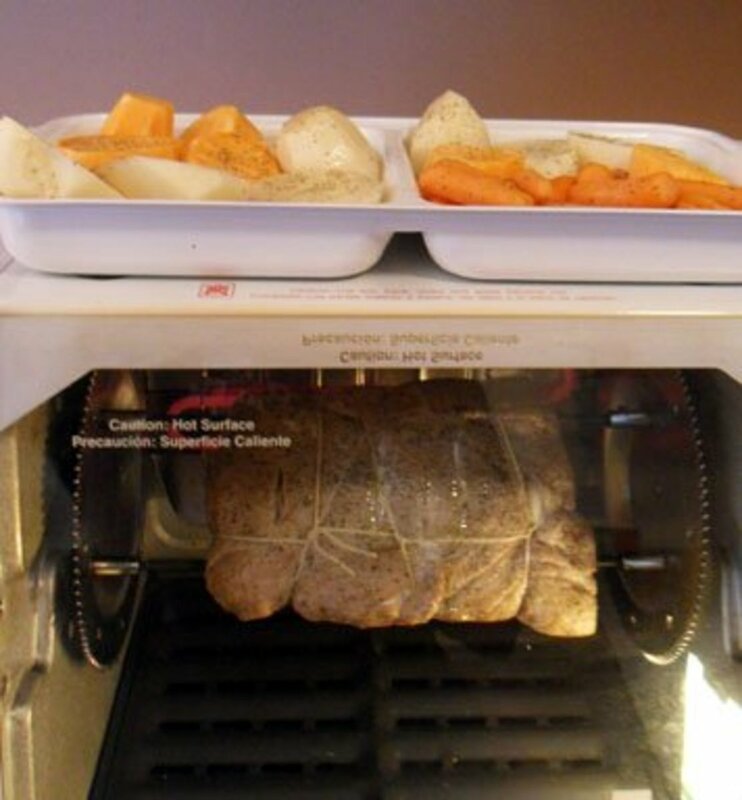 Calculate the weight of your roast by at least 20 minutes per pound or when the internal temperature reaches 160 degrees Fahrenheit. Do not overcook or the meat will be dry. Carefully remove your roast from the rotisserie, of the rod and onto a serving platter. Let the meat stand undisturbed for 5-10 minutes and then carve the meat as usual. We are fortunate to have a steamer on the top of our rotisserie, so we steamed potatoes, carrots, sweet potatoes and onions for this meal. Essentially everything is cooked in one spot, which certainly makes clean-up a lot easier. 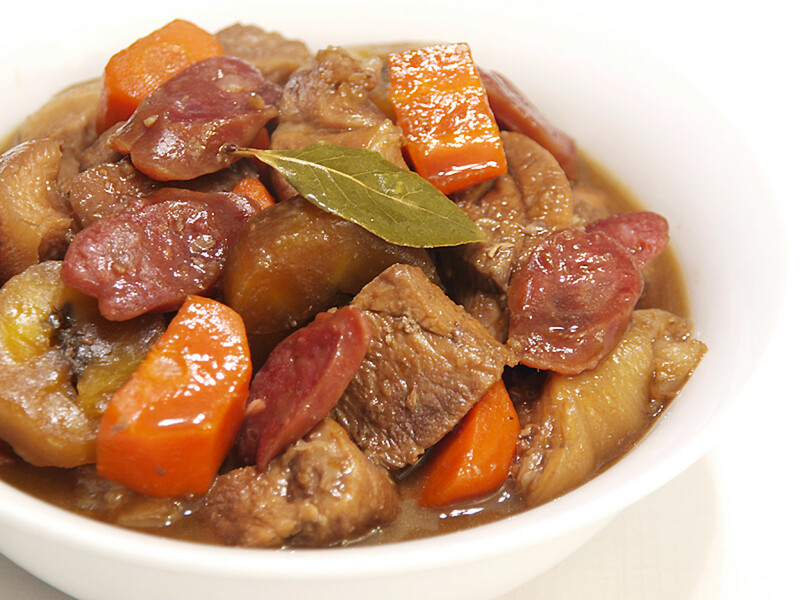 This unique recipe is served as a main dish, but can also be served as a first course, or chopped up and used as a filling for hot dumplings. Remove the bone in the pork loin, then prick the meat with the point of a sharp knife. Cut into slices 1 1/2" thick. Mix the sauce ingredients with the red food coloring and sprinkle over meat. Let marinate for 1 1/2 hours. Thread one end of each strip of meat onto a metal skewer. Suspend the pieces of meat from the top rack of the oven. The meat will hang through the rack, while the skewer rests across the rungs. Leave the meat to hang and dry for 45 minutes. Roast the meat in the oven on 350° for 20-25 minutes, basting from time to time with some of the honey. When the pork is almost done, brush with the remaining honey and let it dry. Serve the meat hot or cold, according to your preference. 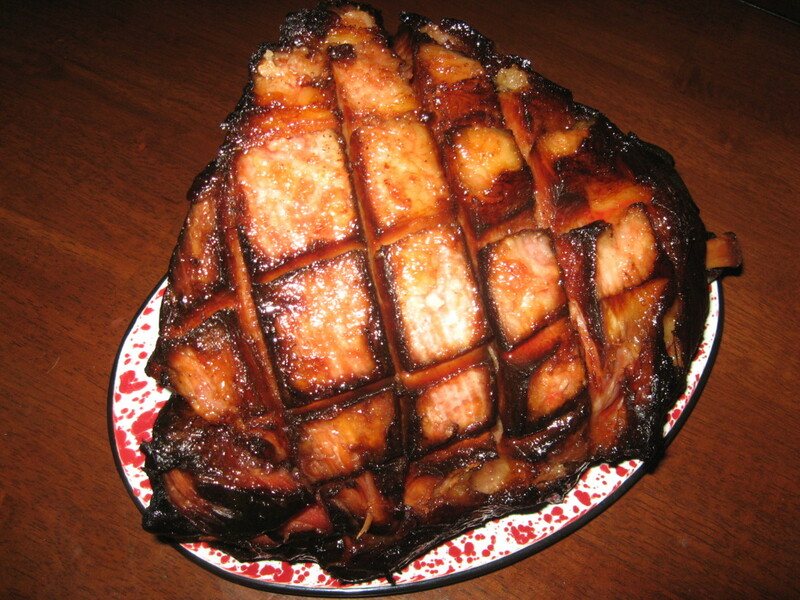 There are certainly many recipes you can cook right in your home with a rotisserie. Most any meat, game or seafood can be cooked in this manner, plus steaming vegetables on the top is a nice advantage. Of course, all of the foods can also be cooked on an outside grill if you have the rotisserie attachment. 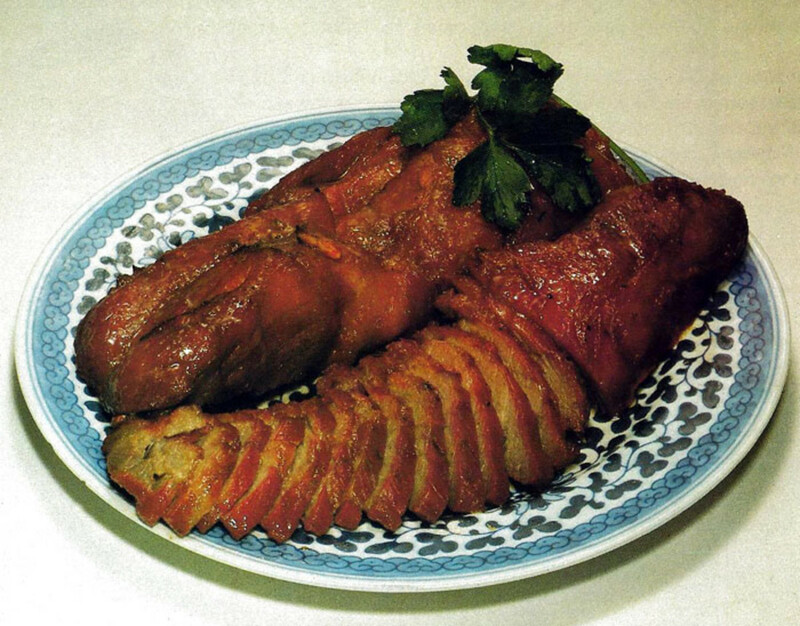 The second recipe is a unique Cantonese recipe that is worth a try to have pork cooked in a different way. The skewers could also be hung in some rotisseries, like mine, as it has 6 skewers. I hope you enjoy a variety of good food! What temperature do you set the rotisserie for to cook a pork loin? My rotisserie only has a high and low dial. I use the higher setting. You check the meat temperature to see when it is done as the recipe states. Eddy, I think you will enjoy it and I appreciate your comments. 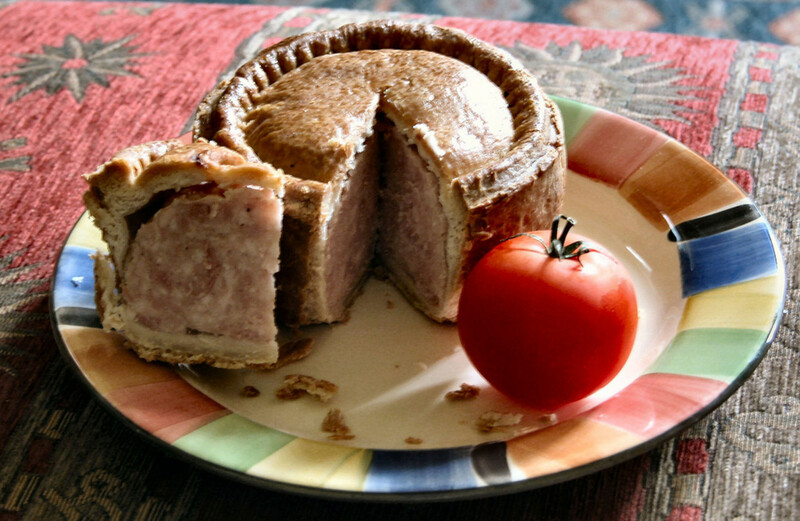 Thank you so much for this great recipe I can't wait to give it a go as it sounds delicious. Have a great day and I vote up plus share. HealthyHanna, I hope you enjoy it. Thanks for your comments. This looks like something I will try soon. Thanks. moonlake, I also like most any meat cooked this way. You definitely get some good flavors from the grill. I appreciate your comments. Peggy, I actually purchased this rotisserie from a neighbor at a garage sale for about $100, but it came with so many extras we decided it was worthwhile. There are about 3 way I can rotisserie different foods, plus the steam cooking on top. It also came with these think rubber gloves so don't get burned. While the company name on the little recipe book is Popeil Inventions, Inc.; on the front is says Showtime Rotisserie & BBQ. I'll see if I can find it on Ebay or Amazon. Thanks for your comments. We don't have a rotisserie in our home or on the grill. Did yours come with your oven or did you purchase it separately? Perhaps you should put an Amazon or Ebay capsule in this hub if they sell them? Your recipes sound delicious. We also eat a lot of pork loin. Gave this 5 stars and up rating. Peggy, I sure hope you enjoy them as much as we do. Thanks for your comments. I love my rotisserie. Love pork loin too. Your first recipe sounds devicious. You second one sounds heavenly. I'll be trying both. I imagine it will be delicious on the grill. Thanks for your comments. 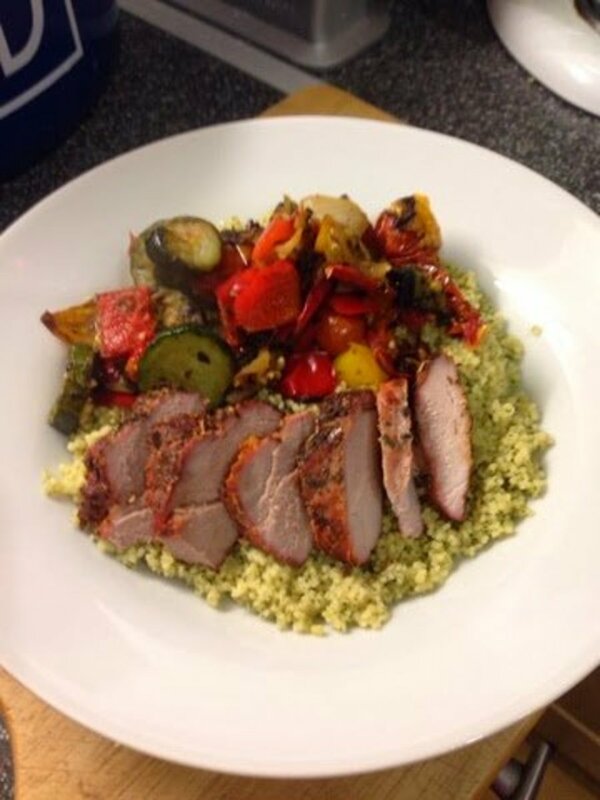 I love pork loin and I like the way you steamed vegetables on the top. 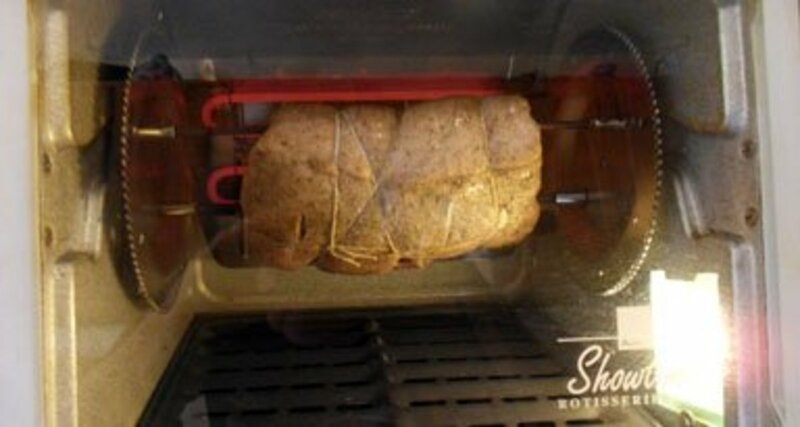 I will be trying that simple recipe on my outside rotisserie/.